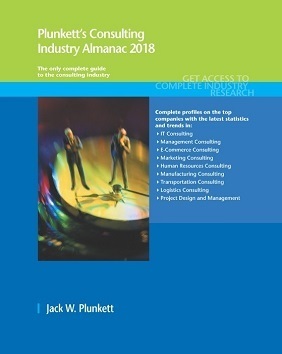 Complete Guide to the Consulting Industry - Plunkett Research, Ltd.
Plunkett Research, Ltd. recently announced an important market research and competitive analysis report, Plunkett’s Consulting Industry Almanac, 2018 edition. It is a complete market research report, including forecasts and market estimates, technologies analysis and developments at innovative firms. Global consulting industry revenues (including HR, IT, strategy, technical, operations, management and business advisory services) will be about $491 billion in 2018, according to Plunkett Research estimates. In recent years, corporate profits in general have grown dramatically, meaning that executives are reasonably willing to authorize new consulting projects, as long as they see the potential for a good return on the cost. This entry was posted in News on September 4, 2018 by NOTadmin.